Urban teens take center stage in a pair of edgy short story collections. 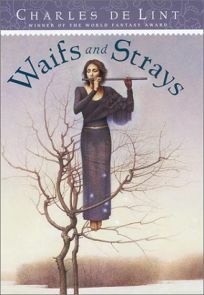 Waifs and Strays presents 15 previously published works by Canadian fantasy writer Charles de Lint, including ""May This Be Your Last Sorrow"" from The Essential Bordertown and ""There's No Such Thing,"" which appeared in Yolen and Greenburg's anthology Vampires. In its first appearance, ""Sisters,"" tells of precocious 16-year-old Appoline, a vampire (""Yeah, I drink blood. But it's not as gross as it sounds. And it's not as messy as it is in some of the movies"") who plans to wait until her sister, Cassandra, turns 16 before turning her into one, too.